Screenwriters often forget how much power they have. The screenwriter is the first person to paint a clear picture of a finished film with the words they choose to put on the page, and that picture should always include every essential detail. Great screenwriters will gracefully focus the camera without ever writing close up or match cut. They will guide actors through subtle character changes without having to put words like angry or thoughtful into parenthenticals. This series aims to teach screenwriters how to also create a vivid world for their story, without designing a single set. I have read far too many scripts that look like this. When these writers are asked why they didn’t describe the setting, they often respond with “Well, that’s the director’s and designer’s job, not mine.” Sound familiar? If you are also guilty of sitting your characters in empty rooms and walking them down characterless streets, you are throwing away your best opportunity to create a tangible world for your reader and therefore your future audience. When you write scenic description you are not designing or directing. The setting for each and every one of your scenes, whether they take place in an elaborate fantasy world or an everyday office, is something you the writer have the power to create. You are not an interior decorator, charged with the duty of selecting wall color and matching furniture sets. Scenes don’t take place in magazine perfect rooms, but rather in places that simply have a certain feeling about them, which can often be captured with a few short phrases. And you definitely shouldn’t describe everything in the room in such excruciating detail that your reader completely forgets what is happening in the story. Key props and set pieces should all be on the page. But rather than putting them into a chunky block of text which describes everything your character can see, objects of importance can be smoothly incorporated into the flow of your action and dialogue. Setting and genre go hand in hand. Just try to imagine a horror movie without a darkened corridor, or an action film without a chase through a crowded urban street. Scenic description will also generate the tone and mood for your film, with size, color, texture and light all playing a part. Your setting will tell us when and where your story is taking place. If you aren’t going to use a title that says “New York 1966” or “Outer Space 2020” (and you probably shouldn’t) then your set is the only indication your audience will have. Scenic description shows us who your characters are, often before they ever even say one word. Where they live, where they work, whether or not they look at home or oddly out of place, and how they interact with their environment are all indications of personality. Masters of scenic description use symbols and imagery to reinforce theme, and give visual weight to key turning points in the story. When written well, your scenic description can tell your story just as well as the rest of your script does. 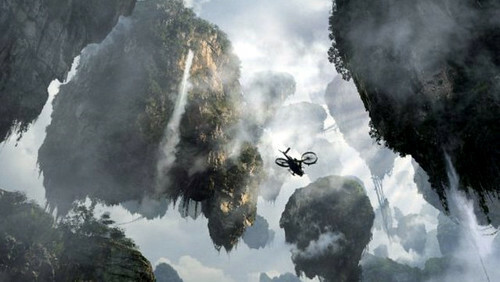 In Avatar, the alien planet Pandora IS the story of the film. More than just the setting, Pandora is Jake’s ally and enemy, a source of conflict and power and another character in and of itself. Imagine if James Cameron had simply described it as “an alien planet” and left it at that. Would we have any idea of its scale and magnitude? Would we know anything about its importance in the story? Would we have any sense of time and place? Cameron literally flies us into this new world, introducing it piece by piece. Through the use of simple phrases like “carpeted in rainforest”, “vast and forbidding” and “the color, too cyan” we can start to form a clear picture of this world, its size, its color and its overwhelming presence. The sudden appearance of the open-pit mine is described with words like “lifeless” and compared to the hard, man-made shapes of cookie cutters and three story buildings. It stands in such stark contrast to the virgin rainforest around it, that we immediately see a clear image of the conflict on this alien planet. Perhaps you’re thinking “But James Cameron directed Avatar so he had no reason to edit down his own scenic description” or “He had an entire fantasy world to write about, so of course he gave it a lot of time.” But consider that the “primeval landscape” and “winged creatures” in this passage later went on to become part of the elaborately designed flora and fauna that were created by a team of designers to bring Pandora to life. When this passage was written, Cameron was just beginning to scratch the surface of the movie that Avatar would become. So whether you are creating an entire planet or a single room, your words play a powerful role in making that world jump off the page and into your reader’s visual cortex. Short phrases and choice adjectives will go on to become the sets, props, lighting and key details that breathe life into your script. So never hesitate to fill that page with life. It is also important to note that James’ descriptive text is actually describing the image the viewer sees not just setting the scene. Some scenes are visually brief in a script and even though there is an entire world behind them, there is no need to describe what the viewer doesn’t see. In the case of the empty room syndrome, if the image is of two people talking and there is no need to focus on the room – why bother describe it if the camera ain’t gonna show it? It seems you are implying this in your article without ever stating it. On a side note – a catalyst for the increase in description-less scripts stems from the fact that many screen writing gurus in LA profess this is the way to make the script easier to sell. For example, when describing a character if you state “32y.o. Asian male with dark, almost black skin” – the reader has to imagine that character. On the other hand you write “a middle-aged man” for example only, then the reader might imagine the new young actors their producer want to give a chance to. Of course this then affects the entire story in keeping it as generic as possible. You are correct that descriptions should only focus on what the camera sees, which is essentially what I was trying to say without saying it. But don’t think that the empty room is okay either. Even if the camera focuses entirely on your characters, scenes never take place in a setting that doesn’t have atmosphere or feeling to it. You don’t have to describe sets and props to be using your scenic description properly. Always always always give your readers a sense of place. What you are a referring to re: character description is also true. I would never describe a character in such specific detail that he can only be cast in one set way. Always leave the door open for your directors and producers and casting directors. But, don’t you think you can do better than “middle aged man”? How about “middle aged man who appears worn around the edges but still has a youthful glow in his eyes”. Yes, it’s more words, but that is a character. Middle aged man is nothing more than a police report. I concur and agree with all your points. “middle aged man” is lame – but unfortunately I have seen “gurus” in LA spout this stuff for the sake of selling a script. Great stuff Margaret. All great advice.